Editorial commentary highlights the firm’s work on major public project and a major dispute relating to Darwin Private Hospital and names both Veno and Danny as part of the firm’s ‘excellent’ practice and ‘exceptionally good’ litigation offering. 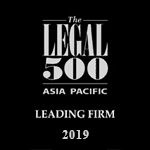 The Legal 500 is widely considered the world’s largest independent referral guide for legal services. It is based on extensive research of law firms based on client interviews and peer reviews across the Asia Pacific. Blackstone Waterhouse is a specialist planning, property and construction firm that acts for major developers and head contractors in projects across Australia. Blackstone Waterhouse assists clients deliver major projects. The firm is based at International Tower 3, Barangaroo.